We are a leading manufacturer & supplier of Mobile Toilet Van such as Portable Toilet Cabin, Eco Friendly Mobile Toilet Van and Bio Mobile Toilet from India. A flourishing enterprise in this domain, engaged in presenting a wide range of Bio Mobile Toilet. 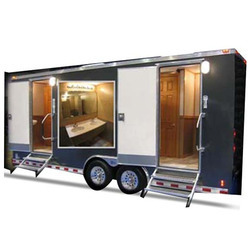 We have gathered a huge customer base in this domain by presenting a comprehensive range of Mobile Toilets. 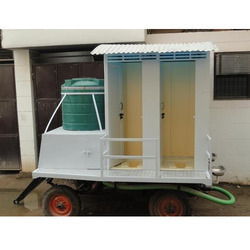 The MOBILE TOILET VAN is manufactured of FRP Panels. , very robust in construction, long lasting and modular in design. These shelters will be provided with gel FInIsh on both sides. every toilet shelter will include a water point, IWC/EWC, natural ventilation, water tank 500 ltrs, Complete plumbing or electrical works, two stainless steel wash basin backside with mirrors. 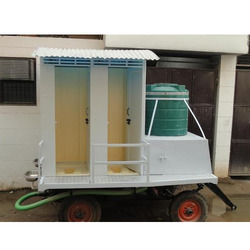 The MOBILE TOILET VAN are constructed of MS Channel and FRP are strong, robust, leak proof and long lasting. MOBILE TOILET VAN will be constructed for strength and rigidity & will be provided with inorganic waste trap to prevent non-decomposable items like clothes, napkins, plastic pouches etc. from going into the digester. The effluent of toilets blocks will be connected with the Bio digester. The effluent of the digester can be used for horticulture and also is safe to be discharged into drain. There is no proposal for any secondary treatment at this time. Our organization takes pleasure to introduce its business as one of the leading entity offering Mobile Toilet Van. The offered toilet van is used in various trade fair and events providing easy and hygienic public convenience to the public. The toilet van is manufactured using quality materials and approved design. Apart from this, clients can get the toilet van from us at industry leading rates. Widely used at various places such as trade fair and other such events. With the excellent support of our brilliant professionals, we are engaged in presenting Eco-Friendly Mobile Toilet Van. The offered toilet finds wide application use in the trade fair. Furthermore, the toilet van is manufactured using quality material and approved technologies. In addition, the toilet van is made available to the clients at marginal rates. Used in the trade fair.